Would DoD Ever Match Service Members' TSP Contributions? In February 2010, the Office of the Secretary of Defense issued a “Report to the Congress” titled Cost and Impact on Recruiting and Retention of Providing Thrift Savings Plan Matching Contributions. The report was a little-noticed product of the June 2009 Thrift Savings Plan Enhancement Act, which empowered TSP administrators to establish a Roth TSP and separately called for the consideration of a TSP “mutual fund window”. A provision in the 2009 Act also included a “Sense of Congress” stating that “members of the uniformed services should have a retirement system that is at least as generous as the one which is available to Federal civilian employees,” but also that “the costs of requiring such a matching contribution from the Department of Defense could be significant.” Congress therefore called for the Secretary of Defense to report to Congress within 180 days the cost to DoD of providing a matching payment, and also the effect of TSP matching payments on recruitment and retention. The result was the 20-page Cost and Impact report. 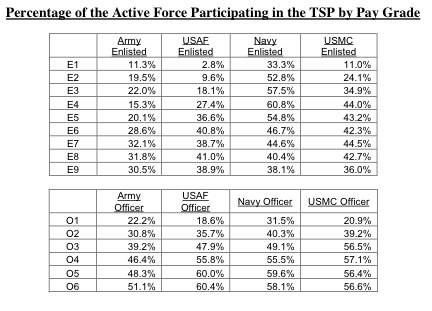 Before discussing the conclusion of the report, it is interesting to highlight some of the report’s details regarding participation among uniformed service members. While the numbers are from August 2009 and somewhat dated, the underlying trends seem to remain valid. Officer participation rates are higher than enlisted, while Navy participation rates are fairly consistently high among both enlisted and officer personnel. The Navy is doing a very good job in encouraging those in the junior ranks to participate in the TSP, particularly compared to those in the other services. The report also noted that percentage contributions stayed relatively steady through service members’ first 20 or so years, then increased between 20-30 years of service. 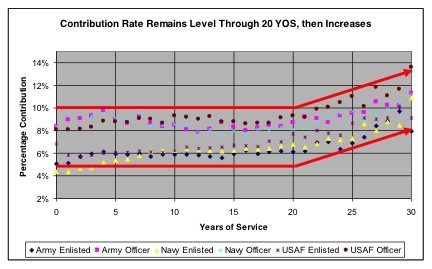 While this is probably a function of service members trying to take the greatest advantage of this tax-deferred benefit before they retire, it might also be skewed somewhat given the relatively short timeframe in which uniformed military could participate in the TSP, which was authorized in 2001. The report specifically pointed out that the Secretary currently can “provide matching contributions for retention in critical specialties and first-time enlistees,” but by law “the initial 1% automatic contribution” that federal (civilian) employees receive “is specifically not authorized.” Therefore, service members would only be entitled to a 4% maximum match— a 100% of the first 3% of the basic pay the member contributes, but only 50% for the next 2% the member contributes. The matches would provide a greater incentive to participate in the TSP, so the annual cost would most likely be higher. Therefore, the report also calculated the cost of 100% participation, with the same 4% matching percentage. “The total projected cost for providing matching contributions assuming a 100% participation rate with each employee receiving the full 4% match is almost $2.8 billion,” according to the report. In examining impact on recruitment and retention, the report also contrasted TSP matching to cash bonuses: “in order for the member to receive the benefit of the matching contributions, the member must sacrifice part of the member’s salary into an account that the member is currently unable to access (i.e., contribute to the member’s TSP account). Thus, the member has to forego current consumption in exchange for a promise of greater future consumption.” Cash bonuses, according to the report, have a more immediate impact on retention because it can be used immediately after the money is received. The Cost and Impact report thus concluded that the cost of matching TSP contributions would be “significant,” but would not “contribute to meeting the recruiting or retention needs” of the military. Congress could still legislate a TSP matching program for military personnel, but in an age of increased austerity, Congress has little appetite to increase budgets by potentially several billion dollars a year for a program that has been shown to be ineffective. Thus the likelihood of TSP matching funds for military personnel is at best remote. Nevertheless, service members can continue to enjoy tax-deferred growth over time by investing a portion of their salaries in the TSP. After obtaining permission from OSD, I’ve attached the full Cost and Impact on Recruiting and Retention of Providing Thrift Savings Plan Matching Contributions to this page.